GFN commenced colour-banding Black-tailed Godwits on July 5 2010. 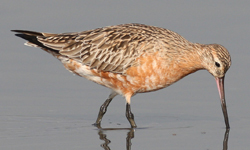 Black-tailed Godwit are much less predictable in their occurrence on the northern shores of Roebuck Bay than the other study species and consequently more difficult to catch. This may be to do with their eagerness to roost on salt pans behind the mangroves, in the north east corner of the Bay. 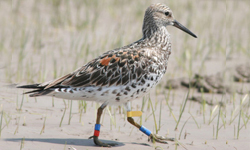 They also move in response to rainfall more readily than Bar-tailed Godwit and the two knot species. 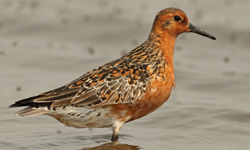 In 2012 between mid-August and mid-October there were approximately 2000 roosting on the northern shores of the bay but after some early rains, inland from Broome, they all but disappeared. However when they do use the northern shores they are predictable in that they will only use the eastern beaches of the northern shores unless there is very heavy disturbance from people or birds of prey. 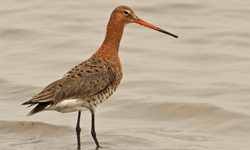 The only records of Black-tailed Godwits on southward migration are two records from the west coast of Kamchatka.